With this pan-roasted cod, you can enjoy the refreshing feeling of a summer ocean breeze. 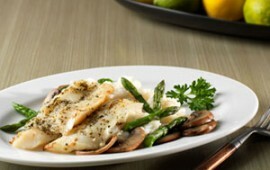 This light dish is perfectly paired with a portabella mushroom-asparagus risotto. Yum! I’ve long loved the Caprese Salad. This recipe courtesy Sea Best Seafood adds the perfect addition to make this salad a nutrient packed entree. 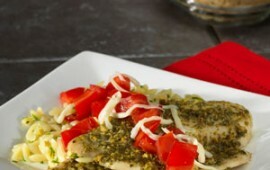 Try it tonight for a fresh new take on Tilapia! 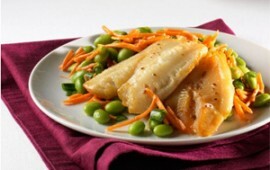 Flavorful cod fillets are marinated in teriyaki sauce, then broiled until golden brown and served with a colorful edamame salad. 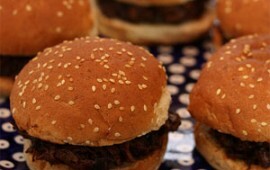 Tell your kids they’re having prunes for dinner and we’re pretty sure you’d have a mini mutiny on your hands. You might have more luck if you call them “dried plums.” to set you at ease, we promise that (a) no one in your family will know they’re eating prunes, and (b) the flavor is so awesome, your kids will ask for seconds. 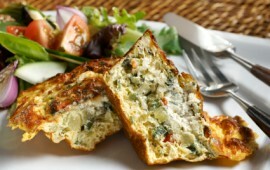 If you’ve ever thought about trying tofu but haven’t quite taken the leap, try this delicious recipe!